Remedial Horror: Chapter x Chapter Review of FILMS OF THE NEW FRENCH EXTREMITY Chapter 1: Viva La Revolucion! As promised in the book's introduction, Alexandra West starts Films of the New French Extremity from the beginning. Like, the very beginning. As in, the beginning of France. Her entire first chapter is devoted to an abridged history of the country with particular focus on its internal conflicts. Now, there are those who may be thinking I bought this book to read about horror movies, not repeat 10th grade social studies. There was once a day when I'd likely agree with you, but now I'm happy for a chance to learn a few things beyond what my American public school education taught me, which consists primarily of different variations on France owing us gratitude for "saving their asses in World War II." 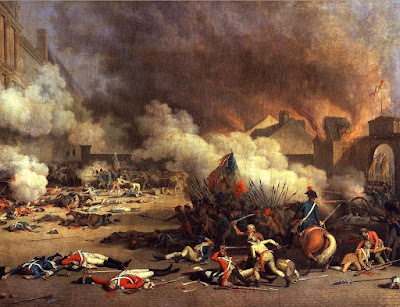 One of France's earliest hobbies was to fight with England a bunch. Their victory in the 100 Years War sparked the deep sense of national pride that would become a staple of the culture. I'm sure most of you know the French Revolution: eat cake, rolling heads, etc. But did you know that there were no fewer than THREE revolutions through the mid-nineteenth century? The Third Revolution would by no means stabilize France, however, as internal and external strife over religion, class, and decolonization (which always comes with a healthy dose of racism) have continued to plague the country to this day with protests, clashes with police, and riots occurring with alarming regularity. If you enjoyed Napoleon, you're going to love the sequel, Louis Napoleon. Napoleon's nephew was elected president during the Second Republic (there have been five). Naturally, he promptly named himself emperor and threw his weight around until he picked a fight with Prussia and lost. If anyone ever tries to sell France as a weak country that the U.S. had to "rescue," I'll point out that this is a nation that survived some of the highest casualty rates during World War I and continued to fight both the Nazis and a government that kowtowed to Germany but brutalized its own citizens during World War II. So while France has done a pretty good job at selling itself as the land of art and fancy cheeses, there are some pretty deep-rooted struggles that filmmakers in the New French Extremity would try to bring to light. But before we dig into those films in earnest, West will use Chapter 2 to take us on a tour of French cinema. How will it hold up to the bloody entertainment of France's infamous Gran Guignol Theater from the turn of the 20th century? I suppose we'll have to press on to find out.